Though his fans were expecting that he would launch the party on his birthday, he preferred to do it on the birth anniversary of Mother Teresa. The actor told his maiden press conference on Sunday that he was inspired by Mother Teresa, who dedicated her life to serve the needy. 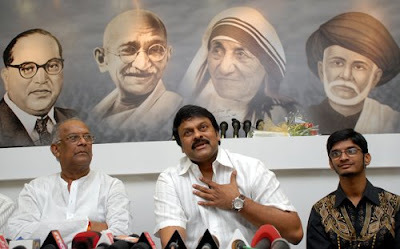 Chiru, who has been acting in films for 30 years, was already engaged in social service and runs a blood and eye bank here. As he dons a new role, his fans are eagerly waiting to see him as the next Andhra Pradesh chief minister.